A new rear-guard for Narukami is revealed that was previously used in the anime, and it works with Thunderstrike. AUTO: [Choose 1 card from your hand, Discard it] When this card is placed on (GC) from the hand, you can pay the cost. If you pay it, choose 1 of your Units being attacked, during that battle, it cannot be hit. AUTO Thunderstrike 4: When this card is retired from (GC), you can draw 1 card. For Today’s Card, we’re introducing a card from the 12th Booster Pack “Dragon King’s Awakening” (on sale August 25th, 2017): The 《Narukami》 Sentinel, “Summon Lightning Dancing Princess, Anastasia”. 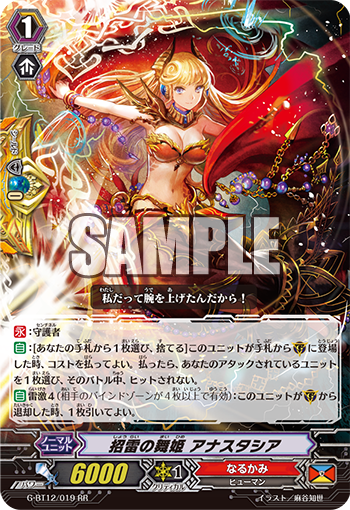 “Summon Lightning Dancing Princess, Anastasia” is a Sentinel with 【Thunderstrike】. In addition to the standard Sentinel ability that lets it protect both Vanguards and Rear-guards, if you’ve achieved 【Thunderstrike 4】 (i.e. when there are 4 or more cards in your opponent’s Bind Zone), when this card is retired from the Guardian Circle, you can draw 1 card. This way you can offset the cost of this card with a draw, meaning you functionally have a Perfect Guard that can called from the hand at no cost. In order to achieve 【Thunderstrike 4】, use cards like “Conquering Supreme Dragon, Dragonic Vanquisher “VBUSTER”” and “Hardrod Dracokid” to increase the size of your opponent’s Bind Zone. We’ll be introducing more cards from “Dragon King’s Awakening” for “Today’s Card”! Please enjoy!